How do we raise awareness, education and support of menopause in the workplace? Speaking up about menopause in the workplace doesn’t come easy to many women. It can feel deeply personal and, combined with a fear of losing their job if their performance is affected, a lot of women are suffering in silence. Thankfully, some employers are waking up to the fact that they can’t just ignore women in the workplace affected by menopausal symptoms. It is likely to affect a large proportion of the workforce. Women experience menopause at an average age of 51 and work until they are in their late 60s. Organisations like Severn Trent, University of Leicester, E.ON taking the lead and various Police Forces across the UK. This can then undermine performance – hot flushes, anxiety, trouble sleeping, loss of confidence, headaches, low mood and poor memory can all play their part. And this is where it’s essential that women feel able to raise these symptoms and work with their line managers to discover how they can be supported. Only by turning menopause into a natural topic of conversation can we transform conversations in the workplace. This means helping others understand what going through menopause really means, not just to aid women’s understanding but for us to know how it feels for our mothers, our partners, our friends. The Faculty of Occupational Medicine have already published guidelines. One big reasons women don’t like to talk about menopause at work is that they’re afraid they will jeopardise their job. This is where managers need to have the right training and education to learn how to manage menopause in the workplace. The best organisations will introduce policies, awareness sessions for employees and train line managers on how to have the right conversations and offer the relevant support. Most organisations would not tolerate any discrimination at work, it’s time to give menopause the same level of understanding. As any woman suffering from symptoms knows only too well, menopause isn’t just something that comes and goes. It is a process, a transition, and something that many women will live with for years. Workplace adjustments may be for a short time to manage certain symptoms, others needed for longer. Women need different adjustments at different times during their menopause journey to help manage an array of symptoms. There have been anecdotal cases of women being told to ‘improve their attitude’ or they would be sacked. Shocking treatment of women as they are struggling at work and in need of support. But even the most well-intentioned employer doesn’t always get it right every time. There should be a clear process if a menopausal woman is subject to discrimination at work. This is even in organisations without a menopause policy. Menopause symptoms are already covered by The Equality Act 2010. This could mean speaking to her union, or following the standard discrimination grievance process. This means for both the organisation and its employees. Not addressing menopause in the workplace is ultimately bad for the bottom line as outlined by the Government Report on Menopause, this ground-breaking research highlighted that organisations not taking account of menopause in the workplace is costing the UK economy millions every year. Employers are losing valuable members of staff who have served them well, possibly for many years. Women are losing jobs or careers they have dedicated their lives to. Organisations need to consider the right approach for their workplace. This could include introducing a menopause policy, offering reasonable adjustments, or a support system. So if a woman is struggling she has a clear pathway to follow. Essentially, it’s about creating a transparent and open environment in which nobody feels embarrassed talking about menopause. Thankfully awareness is growing. Hopefully this will continue as organisations appreciate that they need to be supporting their workforce. However, there’s little point an organisation or a leader simply understanding menopause, or realising that it exists. We need to transform this awareness into positive action to acknowledge, support and effectively manage menopause in the workplace. 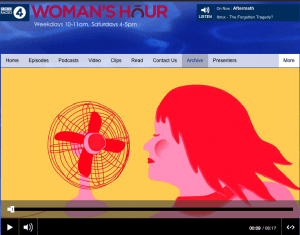 Interview on BBC Woman’s Hour with Ruth Devlin and Deborah Garlick and Diane Danzibrink discussing menopause in the workplace.